Scrupulous price watching is many a time irksome, and frankly unnecessary. At least we think Buona Terra is of such benevolent belief. 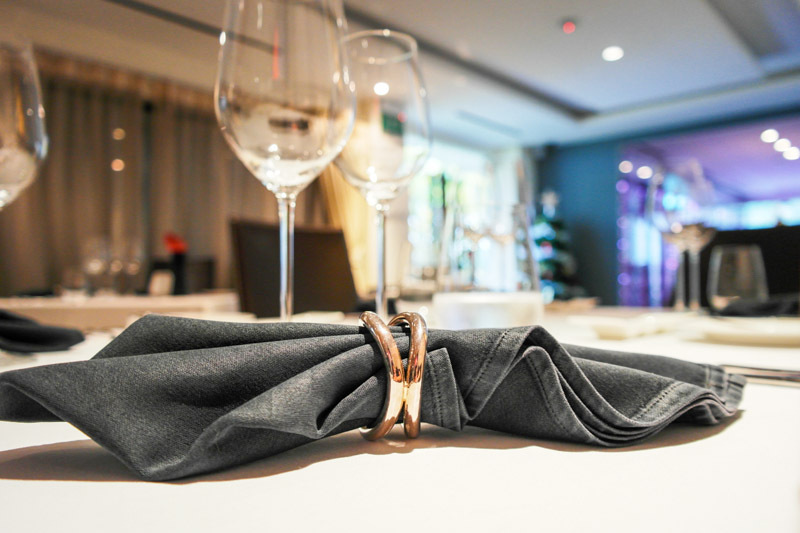 At the Italian restaurant residing in Newton area at Scotts road, their menu comprises of a set without an a la carte selection, in a fuss-free effort to restrict prices to reflect only the 4 available astrologically-named menus. 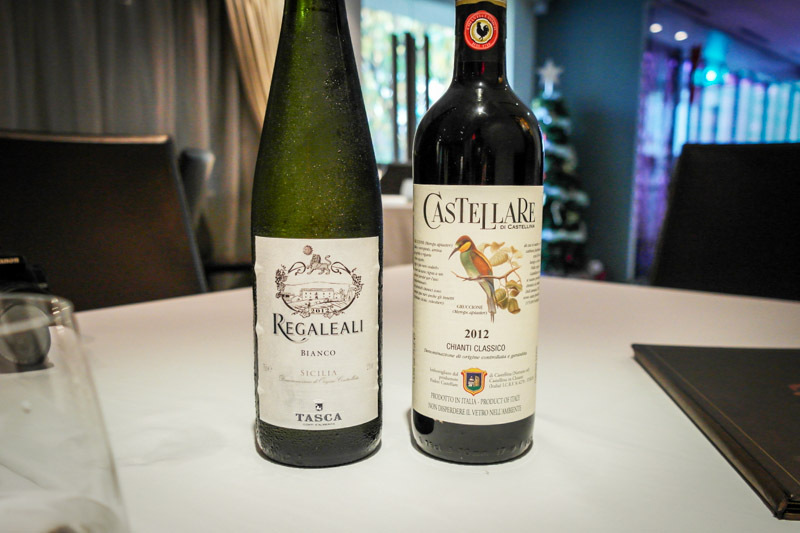 The remarkable array of wines at the misty entrance of Buona Terra is managed by Chief Sommelier Gabriele Rizzardi, the genteel Italian who will ensure the smoothness of your wine pairing (starting from $16++). 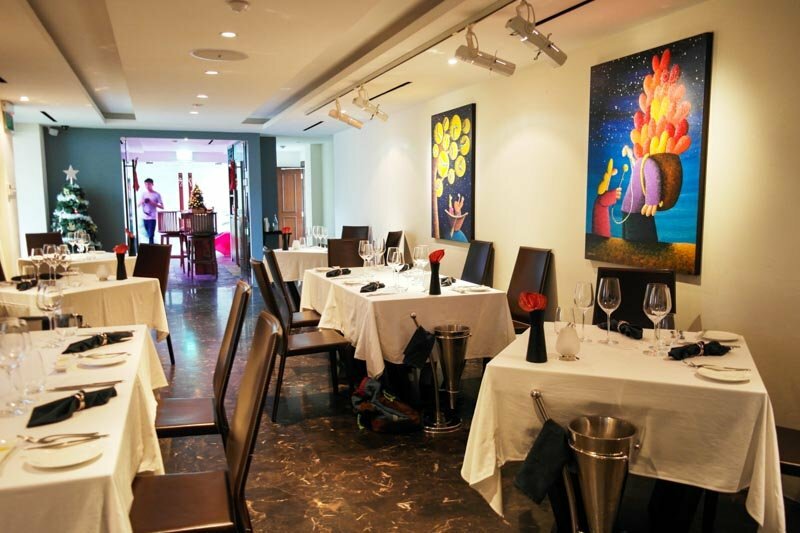 Inside the restaurant, whimsical paintings struggle to fit with the ostentatious spotlit dining set that includes a private aristocratic room. 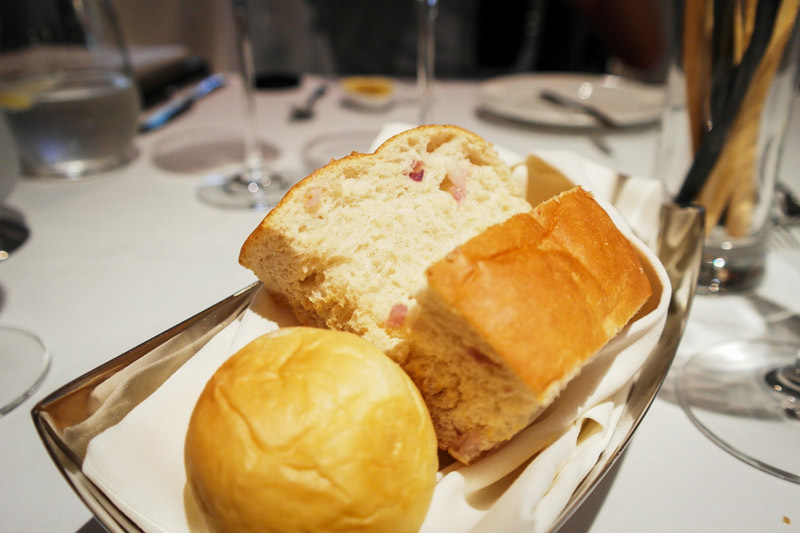 The warm homemade soft breads as a starter were an absolute delight. Just dip some olive oil for an appetizing start. Antica Fratta. 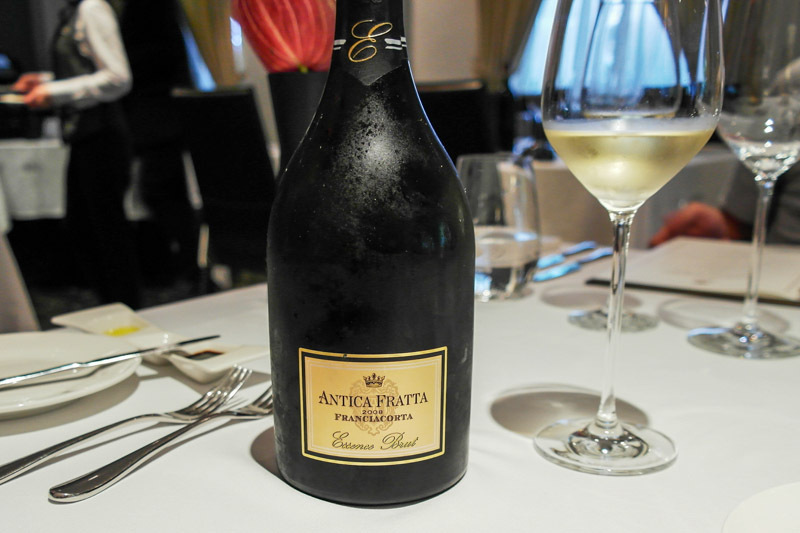 Receiving some complimentary sparkling wine was perhaps the warmest gesture of the day. Ours was a light-bodied mix between Chardonnay and Pinot Noir. As with the rest of the wine and appetizer, the complimentary drink is perpetually on rotation. Amuse-bouche. 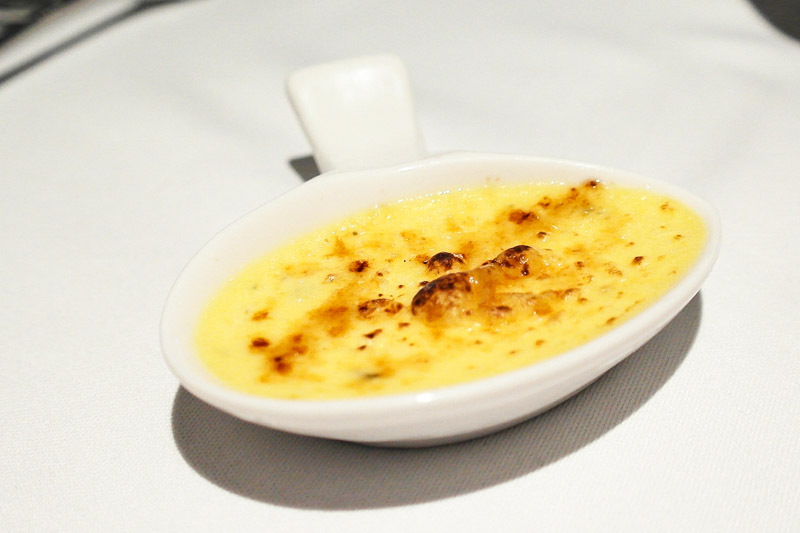 Thursday presented us with a crème-brûlée-like Sicilian dish that was, though small, a generous mix of cheese and cream to whet our appetites. 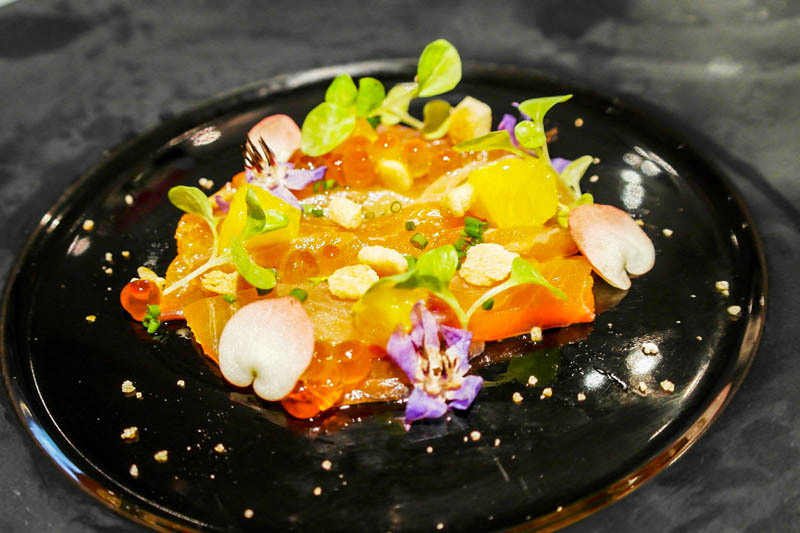 Carpaccio di Salmone Marinato (Cured Salmon Carpaccio with Orange and Capers). A wealth of diminutive treats such as ikura, orange, and capers is sprawled across the fresh slices of salmon that were just a little salty and cleanly flavoured, perhaps from the citric acid reaction. I always enjoy such forms of seafood and it’s safe to say this one was equally excellent. Tonnarelli ai Cannolicchi (Squid Ink Tonnarelli with Bamboo Clams and Bottarga). 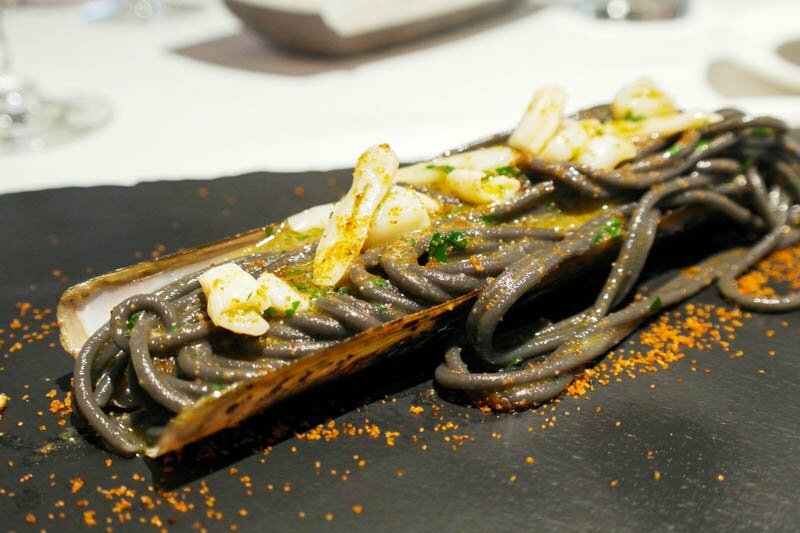 The ominous black tone in most squid ink pastas is in Buona Terra replaced by a delectably clean olive oil coat on the tonnarelli pasta that is served on a bamboo clam shell with pallets of sliced bambo clam. What looked like chili powder lining the gray and fairly delicate also adds a tinge of spice. 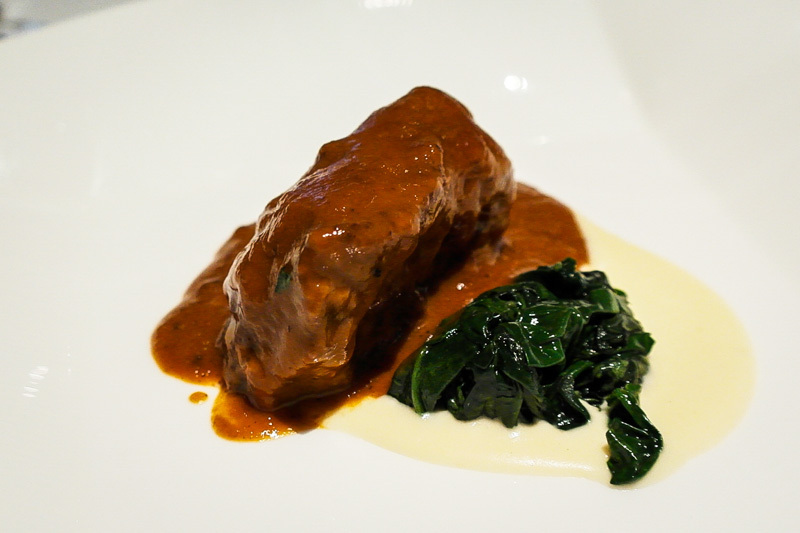 Guancetta di Wagyu (Braised Wagyu Beef Cheek with Potato Cream and Red Wine Sauce). Smooth potato purée and spinach are served alongside this incredibly tender wagyu cheek drenched in a red wine reduction braised sauce. The fat in the cheek that is teeming with beefy flavour is evenly distributed in what we know to be the chef’s secret recipe. The serving was not exactly large, and being so delicious, I would easily have devoured multiple portions. Definitely a highlight here. Traditional Tiramisu with White Chocolate. 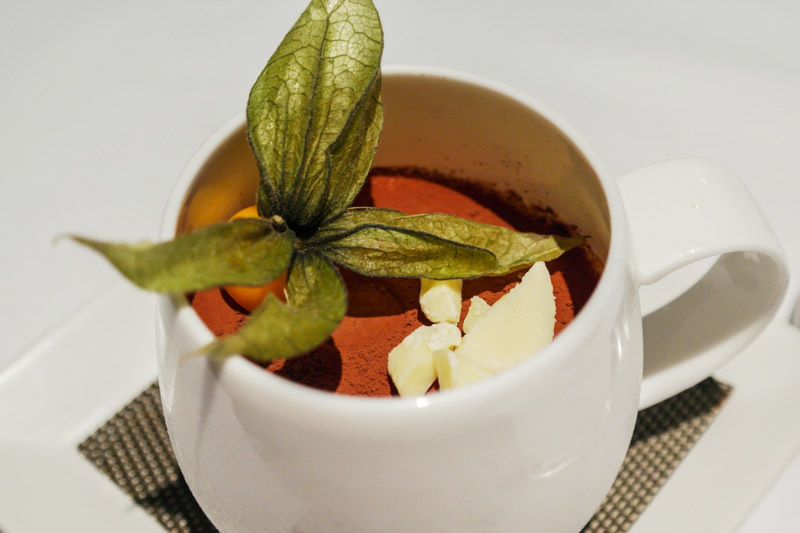 White chocolate and cocoa powder tops a circular cup of tiramisu that is genuinely sweet without parching the palate. Above the bed of cake is an impressively soft creamy mixture potent in liqueur. Individual portions of tiramisu ensure its moistness is retained. Regaleali Bianco. Rizzardi handpicked the Regaleali Bianco, a balanced blend made with grapes indigenous to Sicilia, for to be paired with the seafood. Though I found the medium-bodied drink to be the slightest bit tepid, Seth picked up an aftertaste of white pepper. Castellare Di Castellini – Chianti Classico (2012). This was the red wine of choice that was paired with the braised beed. A nose of sweet red cherries, strawberries, plum and very fruity. A light to medium bodied wine that is tannic and elegant. With every order of the set menu, you are entitled to a glass of wine for $16. For certain, we were not disappointed by the food, though I wonder if the full meal can fill larger appetites. 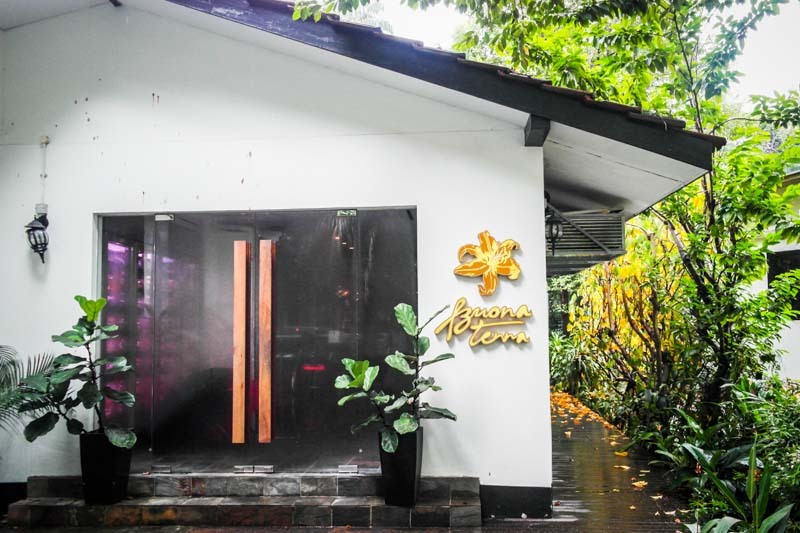 Nevertheless, Buona Terra appears to be perfect for quiet fine dining with personalized wine service to rival any other establishment.